A standard Python installation is required, as well as any additional Python modules that are listed in the README file under the “Dependencies” section. PyRDM is designed to run on the Linux operating system. It is recommended that users use the terminal to install and run PyRDM. Note 1: sudo is likely to be necessary here if the default install directory is located outside of /home. This will yield a system-wide install of PyRDM, which is recommended. You may wish to add this statement to your /home/your_username/.bashrc or /etc/bash.bashrc files so the PYTHONPATH is set correctly each time you log in. The contents of the new file pyrdm.ini should then be modified as per the guidance in the following subsections. PyRDM requires a personal authentication token in order to publish and modify files using your Figshare account. You will need to login and use the Figshare web interface to generate this authentication token, after which you should paste it into the figshare section of the configuration file. In the description box, type “PyRDM” as per figure:create_token. The details for the new personal access token. Click Save. The token will appear and should be pasted into the pyrdm.ini configuration file. Click Done and the new token should appear in the list, as per figure:token_list. The new personal access token. Note: If you are publishing through a group account, you will need to ask the account’s administrator for the authentication details. Zenodo uses a personal access token to handle authentication. Enter PyRDM as the name of the token. Ensure that deposit:actions and deposit:write are selected, as per figure:zenodo_token. 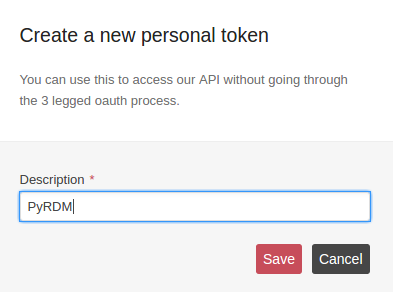 Setting up a new personal access token for PyRDM. Click Create. The access token should be pasted into the [zenodo] section of the pyrdm.ini configuration file. Zenodo requires at least one author’s name and affiliation to be present when creating a deposition. For a software deposition, PyRDM will try to obtain this information from the AUTHORS file. However, for a dataset deposition, this information needs to be provided under the [general] section of the pyrdm.ini configuration file. PyRDM provides limited support for publishing with DSpace-based services which use the SWORD protocol (version 2). Locate the URL of the SWORD Service Document, and add it under the [dspace] section of the pyrdm.ini configuration file. Note: this URL may need to be obtained from the system administrator. Add the title of the DSpace Collection that you want to publish in. Note: the publication’s privacy settings are determined by the DSpace Collection, not by the private parameter in PyRDM. Add your user name and password used to access the DSpace server. Note: this is currently stored in plain text, so make sure that the PyRDM configuration file is not readable by other users. on the command line. Many of these tests require access to a Figshare and a Zenodo account, so please ensure that the pyrdm.ini setup file contains valid authentication tokens.